I find that I don’t make pie nearly enough. For some reason, I find it to be much more time-consuming than cupcakes or cookies, but in all seriousness, pie is very simple. Your food processor basically does all of the work to make the crust, and heck, sometimes I’ve even made pie crust in the stand mixer…still works great. The secret to an easier pie crust for me is frozen butter. I like to cut the butter in small cubes, then throw them in the freezer to make them extra cold. This is one of the few desserts where you want your butter as cold as possible, because as you work with the dough, it warms up and is just miserable to work with when it’s no longer cold (at least in my very beginner pie-making experience). I have been having a killer craving for some apple pie, and since I had a batch of caramel sauce handy (Why do I do that to myself? ), I figured there HAD to be a recipe out there for caramel apple pie. I got to googling and found this one. Since I already had the caramel sauce, I just used that in this recipe instead of the caramel recipe that Williams-Sonoma had. This pie came out so good, y’all. The filling just melts in your mouth, and their recipe for pie crust has such a wonderful, buttery flavor, as well as a bit of a flaky texture. Just SO good. If you want to bring something a little different to your Thanksgiving dinner, this is a tasty twist on the American classic. 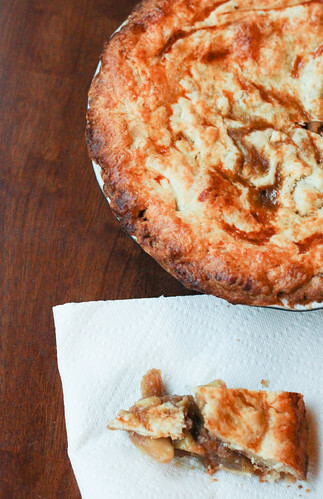 Now, if this caramel apple pie isn’t your thing, you can definitely find other ideas this week. Come join Love the Pie with TidyMom sponsored by Whirlpool and enter to win a new Whirlpool Range! Be sure to check out TidyMom’s website for other great pie ideas and recipes! The party is going on all week! To make the pie crust, combine the flour, 2 tbsp. of the sugar and salt in a large food processor and pulse the mixture to combine. Add the cold cubes of butter and pulse the mixture until it resembles a coarse meal. Add 6 tbsp. of the ice water and pulse the mixture twice. Check the dough for consistency by squeezing it with your fingers. If the dough holds together well, the dough is fine. You don’t want the dough to be crumbly (too little water), but not sticky either (too much water). If you need to add water, add it 1 tsp. at a time and pulse twice after each addition. Once the dough is at the consistency you need, place the dough on a work surface and divide the mixture in half. Shape each half into a dish and wrap each with plastic wrap. Refrigerate the dough for at least 2 hours (or up to 2 days). To roll the dough, remove it from the refrigerator and let the dough stand for 5 minutes. Place 1 dough between 2 sheets of lightly floured wax paper & roll it out into a 12-inch round, to about 3/16″ thickness. Repeat for the other disk of dough. Take one of the doughs out from between the wax paper sheets and gently press it into a 9 inch deep-dish pie dish. Refrigerate both doughs for another 30 minutes. To make the apple filling, place the apples, brown sugar, cinnamon, nutmeg & lemon juice in a large dutch oven. Cover and cook the mixture, stirring occasionally, for about 20 minutes, until the apples are just tender (you can easily check by sticking a fork in an apple slice). Once the mixture is done, uncover the pot and allow the filling to cool to room temperature. Stir in the cornstarch. Preheat your oven to 400 degrees. Once the filling is cool, take out your pie crusts and allow those to sit for 5 minutes. In the meantime, stir the apple filling and 3/4 cup of the caramel sauce together (the rest of the caramel will be for serving). Pour the apple filling into your pie dish, and then place the top crust over the pie. Cut off any remaining dough hanging over the edge of the pie dish, and then press the top and bottom crusts together. Brush the top crust with the egg wash, and sprinkle the top crust with the remaining 2 tsp. of sugar. Place the pie dish in a jelly roll/baking sheet. Bake the pie until the crust is golden brown, about 1 hour. Be sure to check the pie after 30 minutes, to make sure the crust isn’t too dark—whatever part of the crust on too dark, just simply cover it with foil. When the pie is done baking, allow the pie to cool on a wire rack for at least 2 1/2 hours before serving. Serve with leftover caramel sauce (warmed) for drizzling (it’s also equally great with ice cream). Enjoy! thanks for linking up! Good luck! shut the front door, that looks and sounds AMAZING. Pinning this so my husband can make it for me when he comes home! And now I’m officially hungry. This looks incredible! I’ve seen this recipe on Williams-Sonoma but have never made it. I need to change that!